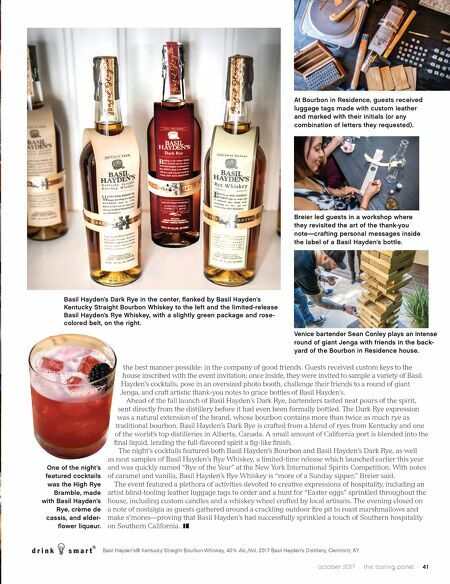 40 / the tasting panel / october 2017 BOURBON P erched in the living room of a gorgeous mansion tucked into the Hollywood Hills, an intimate group of Los Angeles bartenders raised their glasses to try the first samples of Basil Hayden's Dark Rye, the newest addition to the brand's line. Nosing for notes of classic rye spice, the group was led through an educational seminar and tasting by Megan Breier, West Coast American Whiskey Ambassador at Beam Suntory. "For me, this is an after-dinner drink all the way," Breier said. "I could see myself enjoying this by the fire." Like Basil Hayden's, Breier is a Kentucky native, and hints of her accent began to show as she spoke excitedly about the spirit's seamless expression of "Southern hospitality." "When I think about what Southern hospitality means, it is kindness, generosity, opening your eyes and letting others in," she explained. Tailored to the Bourbon in Residence experience, the venue provided an immersive aesthetic for experiencing Basil Hayden's bourbon and rye in House of Wonders BEAM SUNTORY WELCOMES GUEST OF HONOR BASIL HAYDEN'S DARK RYE AT BOURBON IN RESIDENCE PARTY by Becky Tsadik / photos by Dustin Downing Megan Breier, West Coast American Whiskey Ambassador at Beam Suntory, in the apothecary room of pop-up space Bourbon in Residence in Los Angeles. An elaborate charcuterie spread included Cypress Grove Midnight Moon cheese, duck salami, lemon cucumbers, and mustard green stems pickled in apple cider vinegar. The setup was reminiscent of a casual house party and was peppered with various games and activities centered on Basil Hayden's.